Over the years, families have requested access to a range of clinical services at Vanguard including individual and family counseling and speech-language, occupational, and neurotherapies. The availability of these services on campus would be convenient for families and improve communication and collaboration with teachers and staff. We listened to you and we are excited to announce the new Vanguard Center for Neurological Health! Effective immediately, individual and family counseling and neurotherapies are available on a limited basis. We have added two counselors this year and are adding a psychologist, counselor, speech-language pathologist, and occupational therapist to offer a full range of services during the 2019-2020 school year. For Vanguard families, individual and family therapy is $100 per hour. Neurotherapies are $125 per hour. To schedule an individual or family therapy appointment with Kevin Goodnight, Julie Dyer, Steven Barnett, or Lea Roman or to schedule a neurotherapy consult with Dr. Jay Mishalanie, please contact Kerry @ kpickering@vanguardprepschool.com or (214) 356-9364. Jill Herrington has consulted with Vanguard on process improvement for the past year and also volunteered on the VPA Scholarship Committee. We are excited to announce that Jill has joined the school full-time as Operations Director and will also assume the registrar functions previously handled by Martha Sharrock. Jill can be reached @jherrington@vanguardprepschool.com. Martha has completed her Registered Behavior Technician coursework and will begin working with students who need more individualized attention while Lauren Campos has assumed the role of receptionist. Lauren can be reached @ lcampos@vanguardprepschool.com. Please join us in welcoming Jill and Lauren to the team and congratulating Martha on her new role! Congratulations to Brian and Julie Himpelmann on winning the drawing for a free month’s tuition! Please remember to return your student’s enrollment contract by this Friday, March 22nd to ensure a spot for next year. We will begin releasing spots next week to families on the lower and middle school waiting lists. 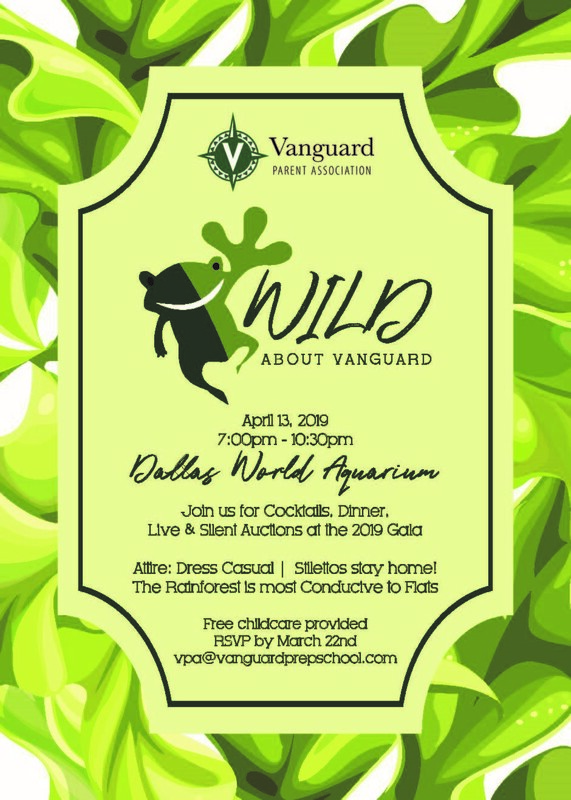 Gala at the Dallas World Aquarium – Free Childcare! We are still looking for vacation getaways, airline miles, sporting tickets, concert tickets, and sports memorabilia for the live and silent auctions. If you have access to any of the above and would be willing to donate, please let us know. Call the front desk 972-404-1616 or email VPA@vanguardprepschool.com. Join us for a basket making party on Sunday, March 31st from 1:00-3:00 pm at Vanguard to help us prepare for the Wild About Vanguard gala and auction! Bring donated items to contribute to one of our themed baskets. The VPA will provide the assembly supplies (including the basket), and you will bring donated items to contribute to the themed baskets! This is an adults only event. Time to hang out and have fun (kids don’t want to come to school on Sunday anyway)! Snacks will be provided, and you are welcome to BYOB. To sign up to participate or donate an item, go to: https://www.signupgenius.com/go/4090849aaaa2faaff2-basket Please send donated items no later than Friday, March 29th. Save The Date! Every year, students in the middle and high schools have the opportunity to hike, whitewater raft, play games, hang with friends, and explore the wonders of beautiful Taos, New Mexico along with some of our Vanguard staff! We will stay at SMU’s Fort Burgwin in camp-like group casitas. If you are interested, please save the date for our 17thannual New Mexico trip from July 27-August 2. We were excited to host Mia Mbroh, LPC as a guest speaker on March 18th for a discussion with our middle and high school students on diversity and inclusion. Mia balanced interactive exercises with discussion to help students understand how we form our identities and define who we are in the world. The students also examined the concept of how we often only see people with our eyes and neglect the unseen elements that reflect who we are inside. She also reviewed relevant vocabulary such as bias, prejudice, stereotypes, etc. Mia complimented our students for being so engaged and respectful during her presentation. We look forward having her speak with our students again! SAMA (Satori Aggression Management Alternatives) is a method used to diffuse anxious or hostile behavior and to provide safe and appropriate protection and containment when an individual is a danger to self or others. The Vanguard Staff and many Vanguard families have been trained in SAMA. A member of our staff, Frank Farino, has been trained as a trainer and is offering a class for parents and other adult family members. One hundred percent of families who have completed SAMA training recommend it to others! Basketball – Another successful Vanguard Viking Basketball season has drawn to a close. We finished the season 4 and 3 and 2nd in the league overall! It was a great year as we had a new wave of players join the veterans from last year. Our individual award winners included Nick Dean (Defensive MVP), Jack Steele (Offensive MVP), Jake Peterson (Most Improved Player), and Dwight Clasby (Team MVP). Thanks to all the parents, staff, and fans who came out for the games. Your support is crucial to keeping the momentum going. Thanks to Chris Cousins and Harry Dyas for leading our students to greatness! Kickball – Kickball season is fast approaching. Practices will be on Thursdays beginning March 28th with games on Wednesdays from April 10thto May 15th. A registration form will be sent in the Wednesday folder for those who are interested. Chris, Harry and Steven will be coaching this year. Following the success of our February field trip to the Dallas Children’s Aquarium (we got to hand feed stingrays!!!! ), Classroom 11 will be venturing to Legoland Discovery Center for a day of Lego adventures and excitement! This month in the Lower School, students are learning mindfulness skills, sharing honest, authentic emotions, and practicing the art of working with others. Turn taking, perspective taking, and practicing expected social interaction behaviors have been a primary focus as well. Middle School students are learning about different forms of mindfulness exercises to calm the “flipped lid” brain and deepening their understanding of emotions including the importance of managing emotions in social interactions and communicating emotions in an effective way. They are also hearing a lot about having “flexible” rather than “stuck” thinking. High School students are learning to recognize that their relationships are affected by the different “games we play” which prevent us from developing healthy relationships. Thanks to the parents who attended the educational seminar on this topic with Mr. Goodnight. In all grade levels, conflict resolution is an ongoing topic as students practice the importance of working through a problem and accepting their role in a conflict in order to reach an agreed upon resolution. It’s important that we keep cars out of the street, so please keep the line moving! If you need to speak with teachers or other staff, please park in a parking space and come into the building.